One thing can be said about the real estate market in Blackhawk Country Club right now…there is just not a lot of inventory. I talk with folks on a weekly basis who are interested in moving up but just cannot really find something that strikes their fancy right now. Let’s hope that as we move into Spring we will see an uptick in the number and types of homes available for sale. 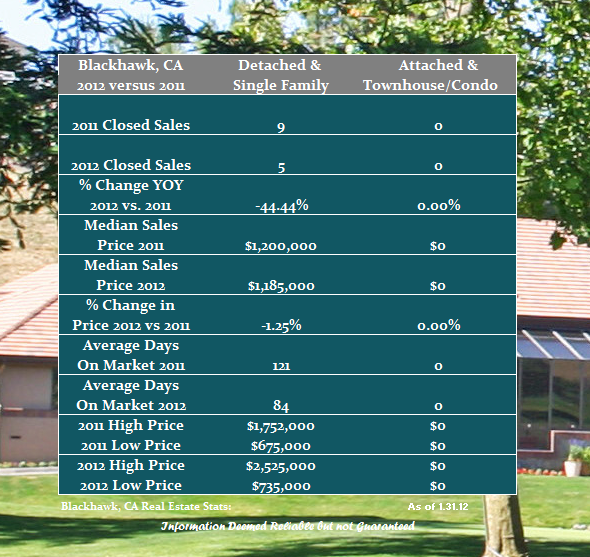 Following are the numbers for January home sales in Blackhawk in 2012 versus the first month of last year. Do you have specific questions about real estate in Blackhawk? Give me a call. Share the post "January Real Estate Update for Blackhawk Country Club"